One interesting fact included in the passenger list for his “second” arrival was the fact that he was naturalized in 1902. I spent some time — and some money — obtaining paper copies of his declaration and naturalization papers through the mail. This morning, I looked through the recent collections added online by Ancestry.com and there was the heading: All Pennsylvania, Federal Naturalization Records, 1795-1931. Needless to say, I quickly checked it out by searching in this collection for August Scheppelmann. Bingo. 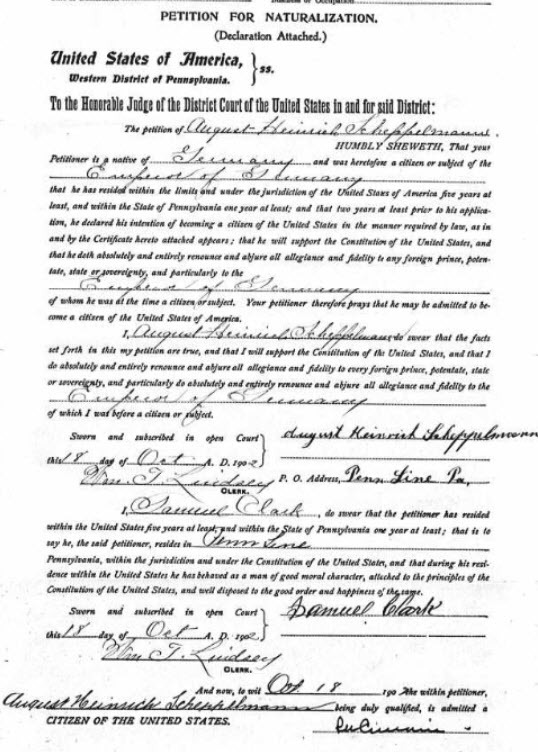 Up popped his Declaration of Intent record and his Petition for Naturalization record. 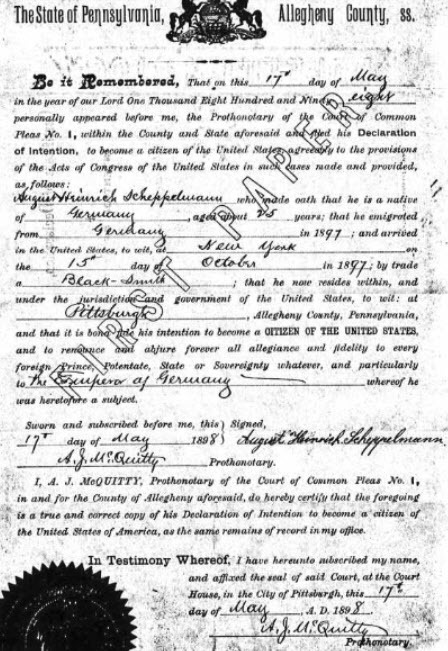 Search results for August Scheppelmann’s naturalization papers. This demonstrates how much easier and quicker it is in 2019 to do genealogical research with the tremendous expansion of online databases on Ancestry.com and other database providers. And it reminds me to keep checking the database collection announcements from Ancestry–and its competitors too. My paternal grandfather Evert Huskonen was a dairy farmer in Williamsfield, Ashtabula County, Ohio. Right across the road from his farm was the dairy farm of Andrew Dingman, my great-great-grandfather. Also in Williamsfield, my Uncle Hugh Huskonen owned and operated a dairy farm. Finally, my late brother-in-law Sydney VanCourt operated a dairy farm in Richmond Center, Ashtabula County, beginning as a teenager and continuing until illness forced him to sell off his cows and property. So as a child I was familiar with dairy farms, milking parlors, and regular milk pick-ups by milk trucks delivering milk to dairies. I also was somewhat familiar with the progress in dairy farming as it changes from hand-milking to machine-milking, and from milk cans to large cooling vats for handling and storing milk. And finally, I was familiar with the seven-day-a-week requirement that dairy farmers be available to milk their cows. On this past Saturday, I drove out to Middlefield, Geauga County, Ohio to visit the Rothenbuler Cheese Chalet. I visited the store and bought some different kinds of cheese. I then watched a 15-min video showing the history of Hans Rothenburger and his cheese-making company. It turns out that he immigrated from Switzerland, where his father was a master cheesemaker. Milk delivery truck from Saegertown, Pennselvania, at Rothenbuhler weigh station in Middlefield, Ohio. Here is another connection. My Four-Great-Grandfather Matthias Flaugh lived in that area of Crawford County, Pennsylvania, and he is buried in a small Saegertown cemetery. He was a farmer and no doubt he had cows. But I doubt that he sent any milk to a dairy or other processing operation. Mitchells Brothers Mike and Greg Mitchell pose near one of their milk hauling truck at Mitchell’s Milk Hauling in Saegertown. The business is a recipient of the 2017 Crawford County Ag-Industry Award. After six decades in operation, hauling milk is more than just a business — it’s a way of life for the Mitchell family of Saegertown. Mitchell Trucking, recipient of the 2017 Crawford County Ag-Industry Award, was started in 1958 by Loren (Pete) Mitchell and his son, Lonnie Mitchell. Today, Mitchell Trucking is in its third generation with brothers Greg Mitchell, 54, and Mike Mitchell, 50, as the owners. The two are grandsons of Pete Mitchell and sons of Lonnie Mitchell. Mitchell Trucking remains a family-oriented operation with Mike’s wife, Michele, managing the company’s books. 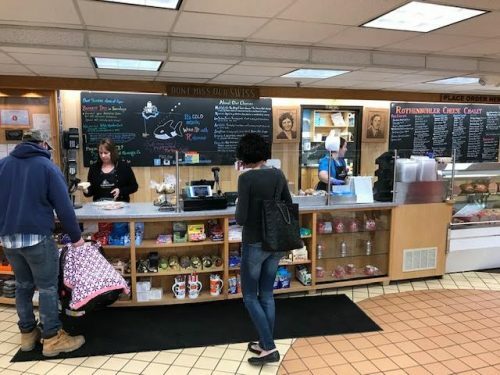 Monica Mitchell, the brothers’ mother, who was instrumental in the growth and success of the business throughout the years, is still involved, too. The brothers said they are humbled at having the company receiving recognition from Crawford County’s farming community. They’ll receive an award that’s administered by the Crawford County Pomona Grange during an open program at 2 p.m. Aug. 20 at the county fair’s Youth Show Arena. Recipients are selected by agricultural organizations and previous Hall of Fame inductees. Both men said they enjoy interacting with the region’s farming community. 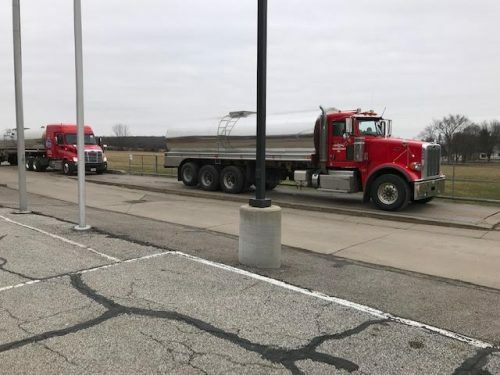 Mitchell Trucking got its start when Pete and Lonnie began hauling large cans of milk from their Spring Terrace Farm near Saegertown as well as other area farms to the Erie-Crawford Cooperative in Saegertown. The Erie-Crawford Cooperative marketed milk for processing to dairies in western Pennsylvania, but in 1969 the cooperative stopped marketing milk as the number of dairies began to shrink. The Mitchells then switched the firm’s focus to hauling bulk milk to dairy processors mainly in Pennsylvania, Ohio and New York. By 1990, Mitchell Trucking was hauling for more than 200 farms. At one time, the company even hauled area goat milk for processing to Vermont Butter & Cheese Co., now known as Vermont Creamery, in Barre, Vt.
Today, Mitchell trucks transport raw milk for about 80 dairy farms in the region. While it’s a much smaller number than about 25 years ago, there’s not been a significant loss in total volume as milk production has increased while the total number of farms has decreased. Each of the farms stores milk at 39 degrees Fahrenheit, or colder, for no more than 48 hours before it’s picked up to be trucked to a processor. With eight trucks in its fleet, Mitchell’s has six of them on the road each day, 365 days a year, with two in reserve in case of a breakdown. Depending on the size of the dairy farm, a Mitchell truck arrives every day or every other day for a pickup. The milk then usually ends up at one of three processors — Dean Dairy Foods in Sharpsville, Dairy Farmers of America in New Wilmington or Middlefield Original Cheese Co. in Middlefield, Ohio [also known as Rothenbuhler Cheese]. Having grown up in the business, both Greg and Mike, said working every day is just part of their daily routine. This article explains how milk is kept safe on its journey from farm to processing, and it emphasizes the fact that milk-handling is a seven-day-a-week job. I plan to have future posts about my dairymen relatives and about cheese-making in general. Today, I will post a transcription of the entire article and a photo of Matthias’ grave in Peiffer Cemetery, a modest burial ground near Saegertown, a borough in Crawford County, Pennsylvania. The reason for revisiting my ancestor is that my grandson Matthew (note the name similarity) will soon be studying the Revolutionary War at school. His mother asked if I had info, and I quickly responded with a positive answer. Johann Matthias Flach came into this world on Apr 8, 1752 in Rimhorn. His parents were the baker Johann Philipp Flach and teacher’s daughter Hanna Elisabeth Merckel. To be sure, Matthias Flach never met his father, as the baker owner died ten weeks before the birth of his son. As for the parents’ house, it became what is today the estate of the Hans Fleck family on Goldback Street in Rimhorn. This comes from the “Rinhorner Broullion,” a draft copy of a map from the year 1753 (Wertheim state archives) in which Philipp Flach’s widow is shown as owner of the plot of land. The married couple Flach had acquired the house with a farm that belonged to it on May 14 1745 at a public auction for 436 builders [guilders?]. The widow with her three small children came through the early death of the husband Philipp Flach with difficulty and presumably she couldn’t keep her property. A daughter, Eva Maria, in 1760 married Johann Leonhard Gebbard who lived in the neighborhood, while of the second son Johann Georg there is no trace. Also not much was known of the emigrant Matthias until later times; it seemed certain that he was lost without a trace. Not until two Americans appeared in Rimhorn in 1986, with instructions from Miss Sara E. Flaugh, Meadville, Pa, and searched for the origins of their ancestors, could the related details of the whereabouts of Matthias Flach become known. Thus was his further journey through life carried out. On the ship “Union” under Captain Andrew Bryson, the 19-yr old sailed over the great water and arrived in Philadelphia, where under the name of Johan Madas Fla on Sep 27, 1773, he gave his oath of loyalty to the English king in the business-place of Mr. Robert Ritchie. On July 13, 1776, he signed himself up as a common soldier on the Roll of Muster for the War of Independence and fought for America’s freedom from the English crown in Captain George Hubley’s Company, which belonged to the German battalion of Colonel Nikolaus Haussegger that was composed mainly of settlers from Lancaster, Berks Co. According to documents he participated in the battles at Trenton, Brandywine, Germantown, and Monmouth. He also fought in the campaign against the Iroquois, who fought on the side of the Loyalists and came to a decisive battle at Newton in Aug 1779. Later he wed a Marie Arnold, who perhaps likewise came of Odenwald. They had four children prior to coming to Crawford County where he acquired 200 acres and here they had four more children. 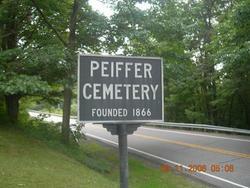 His final rest is in Peiffertown Cemetery two miles south of Saegertown. 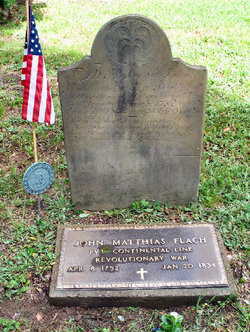 His gravestone still exists and it contains in translation the following inscription: In memory of Johann Matthias Flach, a soldier of the American Revolution, born in Rimhorn, Germnay, on April 8, 1752 and died on Jan 20, 1834 at the age of 81 years, 9 months, and 12 days. Merciless death, unerring arrow, you have penetrated the old veteran’s heart. His whole life long he steadfastly defended freedom, which he fought to secure under the “great” Washington. Note: I also want to thank Miss Sara Flaugh for graciously loaning this article to me. She also had a more legible slab laid in front of the original stone with a bronze medal of the Daughters of the American Revolution. Miss Flaugh also gave me the following: Wilhelm Flach–citizen and member of the court at Nacket. On Nov 27, 1732 his son, Johann Philip Flach, baker married Johanna Eliszabeth Merckel, daughter of Hans Adam Merckel, a teacher. Johann Philipp Flach born at Rimhorn, Jan 4, 1710, died at Rimhorn, Jan 23, 1752. Johanna Elisabeth Merckel born at Rimhorn Feb 12 1713, died at Rimhorn Sept 25, 1776. The newspaper article was transcribed and comments added by Mary Jane Thomas. This oral family history was recorded on a reel-to-reel tape recorder in 1969 or 1970 at the home of Wallace and Mary Jane Huskonen, 6644 Hawthorne Dr, Brecksville, Ohio. Speaking was Mary Jane Huskonen (born Dingman, known simply as Mary) with comments by her son, Walfrid. Mary made the recording for her granddaughter Karen who was born on 19 Sep 1968 to Wallace and Mary Jane. The recording was transferred to a CD almost 50 years later on May 27, 2017, by A. Miklos Video, Brecksville, Ohio, and both the original recording and the digital copy are currently in the possession of Wallace Huskonen, 9240 Meadow Lane, Brecksville, Ohio, who transcribed the audio. Note: Most of the following is a literal transcription from the CD with minor edits for smoother reading and understanding and some parenthetical comments in square brackets to clarify facts or correct errors based on recent research. Mary: I am Karen Huskonen’s grandmother. Her father, Wallace, and I thought it would be nice if we had a history of our family. I’ll start with Karen’s paternal great-grandfather and great-grandmother. They were born and raised in Finland. Her great-grandfather [Evert Huuskonen] was born in Vesanto and her great-grandmother [Ida Maria Hytönen] in Saarijarvi. I had to have a little help from my son Walfrid on the pronunciation of that name. Karen’s great-grandfather’s parents owned a large farm and had many tenant farmers living near them. They owned a store and were considered a rather wealthy family at the time they lived there. Her great-grandfather followed horse racing and was sort of a gambler. And he was also due to be called up to serve in the Russian army. The Russians occupied Finland at this time [Finland was a Grand Duchy of the Russian Empire]. So, his parents decided that they would send him to America, and he came first. Her great-grandmother, her great aunts Mary, Edith, and Wilma and her great uncle Emil were living in Finland at that time and her great aunt Edith went to school there. After her great-grandfather had been in America about 2 years [his stay here alone was from October 1902 to August 1903], he sent for his wife and four children. They came to this country in 1904  on a Cunard Line boat [SS Aurania]. They came to Ashtabula, Ohio [Conneaut, Ohio] by train traveling by way of Albany, New York, and Buffalo, New York, to Ashtabula. Great-grandfather Huskonen traveled originally to Houghton, Michigan, to work in the copper mines, but he didn’t stay there long because he didn’t like working underground. He came back to Ashtabula [Conneaut] and worked [as a laborer] in the train yard and roundhouse where they repaired trains and engines. Karen’s Great Uncle Hugh was born in Conneaut in 1904. By 1910, the Huskonens [Americanized spelling] were living in Ashtabula, where Karen’s Grandfather Walfrid was born one year later in 1911. Her great-grandfather was not happy with this kind of work [working as a laborer] and he wanted to go back to farming. The family eventually moved to Kinsman, Ohio, and lived on a very large farm with a very large brick house. During that time, her Great-aunt Edith and her Great-aunt Mary were married from this house. Edith moved to New York and Mary back to Ashtabula. Eventually, Karen’s great-grandparents moved from Kinsman to Williamsfield across Center Road East from my Grandmother Dingman’s farm. Karen’s great-uncle, Walter, also lived on the Dingman farm. Wilma and Hugh and Walfrid were still at home and attended school in Williamsfield. With the Huskonens living across the road from Grandmother Dingman’s farm, I met Karen’s grandfather Walfrid at a very early age while visiting my grandmother. Whenever I and my brother Ding visited, we would play with Walfrid. Edith married a gentleman by the name of Frank Nikkari, and they moved to New York. He was a shipbuilder and carpenter and they lived in New York for some number of years. Walfrid: It’s interesting to note that the name Nikkari translates into carpenter in English. Mary: After many years, I would say 25, Edith and Frank moved back to Ashtabula to the neighborhood where they lived when they first came to this country. Mary married Harvey Siekkinen and they went to Ashtabula. He was an engineer on the Pennsylvania Rail Road all his life until he retired a few years ago. Karen’s grandfather Walfrid and I were married in 1934. We first lived in Andover and then we went to Cleveland where he did pattern work. 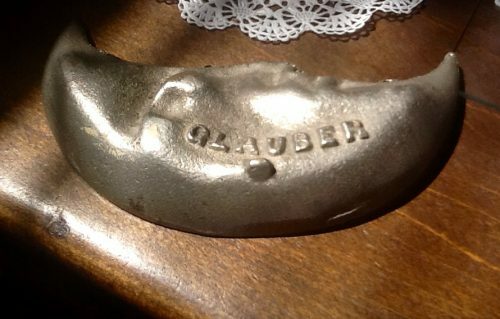 And because his parents needed someone near them, we moved back to Andover, and he worked for a company called Glauber Brass in Kinsman, Ohio as the head patternmaker. When he was 40 years old, Walfrid quit his work because it had been a pledge to himself that at 40, he would have his own shop. For a few years, we did work in the basement of the house and the garage, and then we had sufficient funds to build a shop. Karen’s dad, Wallace, was born in 1938, her Aunt Viena was born in 1940, and her Uncle Walfrid was born in 1941. The shop was started in 1952 with a small section that our two boys helped their father build. And from then on, additions were made. I believe there were four additions made before Walfrid’s death in 1965. We always felt that we did rather well with the shop. We were able to put the children through schools of their choice, Wallace going to Case Institute of Technology [Cleveland, Ohio], Walfrid to Hiram College [Hiram, Ohio], and Viena to Katherine Gibbs School in Boston. Walfrid: There weren’t any other relatives from Finland, except a brother and a sister of Grandma Huskonen’s, and the only one who anyone really knew was Grandma’s sister, Aunt Matilda Viik. She lived in Ashtabula. Her husband [Bill Viik] worked on the railroad, the New York Central. She wouldn’t go back to Finland it was said because she had had such a rough passage by boat, and she wouldn’t fly. But Bill went back every once in a while. I remember going over there one time with Dad after Bill had returned from Finland to see things that he had brought back. The thing that I remember the most was a cane that came apart and had a sword in it. Grandma’s brother also was here, but no one really seems to know anything about him. I remember Dad telling about him stopping by when they were on the farm and he was riding a motorcycle. That’s the only thing I remember. His last name would have been Hytönen. When I was [going to school] in Finland and Mom and Dad traveled there we visited people who lived where Grandpa had lived and the only relatives that we knew about were very distant cousins. There was one fairly young man named Paavo Huuskonen who was a race car driver, driving his Saab on frozen lakes. There is a marker in Vesanto that is a memorial to the Huuskonens. And there is a story about the origin of the name that it doesn’t really mean anything, or if there was a meaning it has been lost. The story behind the origin of the same is that in Finnish the word Huusi is the past tense of shout and if you add a “ko” suffix to any verb form or word it’s a question, so if you say “Huusiko” it means “did they shout?” or “did someone should?” And then if you use the term “ne” it’s in the derogatory sense. So, there is this kind of funny story that the name Huuskonen came from “Huusi ko” and it was shortened to Huuskonen. But that is a story that someone probably made up. Mary: Paavo’s mother and his sister were living in this very huge log house. It had many rooms beautifully kept. Because their winters are so long, they kept large plants in their houses. Their name, by the way, was Huuskonen. And they were so proud of their son, who lived next door. We were there in 1961 and the son’s house was very new. It had steam heat which was a great improvement over the fireplaces. Walfrid: They are not really fireplaces such as we know them, but they are an older form of central heating in that there is a corner stove that is made by bricking the corner. A fire is made in the stove to heat the bricks and the bricks will hold the heat for a long period of time. The bricks have a tile facing so that they are ornamental as well as useful. This feeds into a central chimney so that more than one room can be heated. There are these stoves in adjoining rooms with the chimney going up in the middle. Mary: If I may digress a little bit, we were particularly pleased with our welcome at the Huuskonen home. Both front doors were wide open, even though it was cool and there was misty rain. And the mother and her son, and a gentleman by the name of ??? were there. And when Viena and I came up to meet them, it was quite a shock to hear the gentleman say “hello.” It was about the first American or English word since we’d been in Finland, especially when we were visiting relatives. He had been to Ashtabula, expecting to stay there and work, but he had gotten homesick and so had come back to Finland. Walfrid: He knew Grandpa in this country too). They say he stayed with Grandpa and Grandma awhile. Mary: Their home inside was lovely. There were many old family heirlooms. We were speaking of the fireplace – the one they had heated four rooms. It was in a central location. And there were two living rooms and two bedrooms that this fireplace heated. We were served coffee in every home we visited, plus some sweets or some kind, cake, cookies, sometimes fruit, but invariably it was coffee with something else. I would like Walfrid to tell about the large family room. We would call it a family room in our country. Walfrid: In the older Finnish homes there is a room called a tupa. And this is generally quite a large room, and in some of the older houses, the logs form the walls. There’s no facing put on them. Generally, there are benches all the way around the outer walls and in one corner there will be a cooking area and there will be a cooking range [or cooking stove], plus an oven that’s used for making baked goods. Now this is generally five feet high, or six feet if it’s a large one, and again it’s built on the same principle as the heating unit, in that there’s a great amount of mass made up of clay and bricks with an opening within this, and the fire is built within this cavity, and the heat penetrates into the bricks and the bricks hold the heat. After the fire has died down, the ashes are then scraped out and cleaned out and then whatever is being made whether it is bread or pastries are put into the oven on wooden paddles. They can make really good food that way. Mary: These rooms are also used for large gatherings, such as dances or just a community or family get-togethers. Karen’s Great Grandpa Huskonen, died in 1947 and her Great-grandmother Huskonen died in 1958 in a rest home. Walfrid: We might also say what their first names were: Grandpa Huskonen’s first name was Evert and Grandma Huskonen’s first name was Ida. It’s rather noticeable that those aren’t Finnish names. I don’t know what the origin of either of them is, but it wasn’t uncommon for Finns to take German names, both given names and sometimes surnames. The taking of a German given name is noticeable in Dad’s given name, Walfrid, which is said to have German origins. Mary: Karen’s maternal Great-great-grandparents, Jared Green and Mary Sumner, were born in Conneaut. They were married in Conneaut, and from that union came Karen’s Great-grandmother Grace, and her Great-uncle Ed Green. While my mother was young, while she was possibly three years old, her father died of an illness, possibly pneumonia, and her mother moved with Grace to live with an uncle. She got married soon after and had a stillborn baby girl. After the baby was born, she was diagnosed with an enlarged heart and she died shortly after. The Morley’s were older people. James Morley had been a landowner and quite a politician in the Andover area. He was an instigator, along with two brothers, in getting the railroad through the town of Andover, probably because they owned property there. Walfrid: There’s a joke that goes with that. It was that Mrs. Morley was a diplomat too in that she invited the railroad men to her house to eat so she helped get the railroad there through their stomachs. In time, Jennie Morley decided that Grace could come to Andover and stay for a short while. And so, the Morley’s sent the money for her to come [to Andover, probably by railroad] and she lived with them until she was married to Karen’s Great-grandfather Wallace. The Morley’s were very good to Grace. They gave her every opportunity. She had everything that anyone might want. Mrs. Morley didn’t like to have anyone bother doing housework, so Grace was able to work in the Post Office if she wanted to. She was very active in plays. She had medals for speaking. She was a very popular person in the community. She married Wallace Dingman, Karen’s great-grandfather in 1904. He was born in Williamsfield on the Dingman homestead. Walfrid: He had met her in Andover in school, hadn’t he? Mary: Yes, because Williamsfield had a grade school but no high school at the time. They had only a one-room school, and Andover had a larger school. So, Wallace came to Andover and met Grace and they were married in 1904. Karen’s Great-great-grandfather Andrew Dingman was born and lived near Jamestown, Mercer County, Pennsylvania, on a farm. Her Great-great-grandmother Mary Elizabeth Betts also was born in Mercer County. After they were married [in 1877], they moved to [what would become known as] the Dingman farm, considered at that time to be a large farm. They had three sons. Nelson was the oldest, and he died about 10 years after he was married to Florence Pratt and they had two daughters, Faye and Ruth. Walter, Karen’s great-great uncle, married late in life to Mina Mae Waid . Wallace, as I have said, married her Great-grandmother Grace. Walfrid: Walter and Wallace were twin brothers. Mary: Yes. One reason Walter was so close to his mother was that he was a very sickly baby. And when they lived on the farm, Wallace did much of the outdoor work, where Walter wasn’t able to do heavier work because he was so sickly. In 1908, shortly before I was born, Karen’s Great-great-grandfather Andrew Dingman died and Great-great-uncle Walter stayed with his mother for the remainder of her years, living on the Dingman Farm. He was, by that time, in good health and able to do farming. They lived very well on the farm. They had one of the first automobiles in the community [Williamsfield]. I can recall that it was a Studebaker. We felt quite elegant riding in it. I can remember riding to Meadville to visit Grandma’s [Betts] relatives, going up the steep hill and we had to get out and put rocks behind the wheels because the motor had gotten so hot that we had to stop. For all the faults, it was still considered an excellent automobile. It was jacked up in the winter to save the tires. The tires were removed and taken to the basement so that nothing would happen to them. It was an open car [touring car] and had what we called side curtains. We felt quite proud when riding in it. Walfrid: We should tell about Aunt Ann [Betts, married name Smith], just because of the expression we’ve used in the family. Aunt Ann was Grandma Dingman’s sister, and she and her husband and family had homesteaded in Canada. 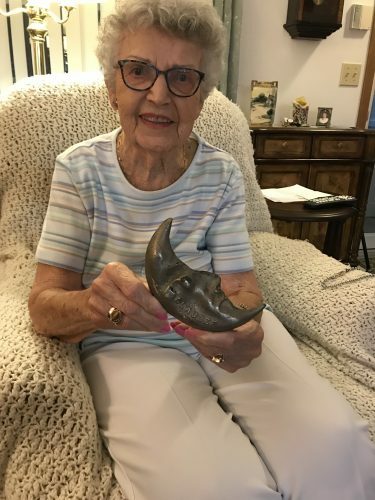 She must have been a real “corker” for all the stories about her: she liked to play cards and dance and probably raise a little hell once in a while. Mary: She had many illnesses. Her legs swelled so very much. But I can recall that after my grandmother died, she stayed with my uncle for some time. Her legs would be swollen, and she could hardly maneuver around. She would sit on the porch and see many cars go past and she’d say “Walter, where are they all going? Let’s go. Let’s find out where they are going.” She was always a person interested in everything. Grace and Wallace were married in 1904 and I was born in 1908 in Conneaut. Three years later, my brother Wallace was born in Conneaut, too. We lived there all our lives until my mother remarried. My father Wallace died in 1920. It was necessary for my mother to earn a living for our family. We did have a bit of savings, but my father had been ill for so long that most of it was gone. My mother had very good friends on the school board [Andover] and they decided, after a conference, that if she would go school at Kent—at that time it was called Kent Normal School—if she would go there for 12 weeks during each summer that they would give her a position. It also helped that she had traveled quite a bit. We’d been to California and other places and they thought that would help her in her teaching. She taught for some time until she remarried. I graduated from East Conneaut High School in 1927. It’s interesting to note that I attended the same school after high school that my mother Grace did. At that time, I was there, it was called Kent College. It’s now called Kent State University. My brother, during this time after my father died, was eight years old, and he spent the summers with my Uncle Walter, while my mother was continuing her education because it was necessary for her to go each summer to do this. Sometimes I went with her, and sometimes I stayed with my Grandmother Morley [adoptive] for the summer. It was a difficult situation, but I don’t think it ruined either of our personalities. I think we were quite well adjusted. My mother went to school for, I believe it was seven years, before she got her certificate to teach. The year before I was to graduate from high school when I was 16, my mother married John Tripp in Andover, and she and my brother moved there. I was very fortunate because my fondest wish was to graduate with my class in Conneaut. One dark, dreary day, when the sun just peeked through the clouds, my mother said she had news for me. It was the fact that they were going to be able to send me to Conneaut to board and finish my last year of school. And I said there is a ray of hope with the sunshine. I graduated the next year and then my home was in Andover. I was away at college for two years, and after that, I taught school for seven years in Bedford. In 1934, Walfrid Huskonen and I were married. We lived in Bedford for a short while, and I said it was necessary for us to go back to Andover to help his parents. They weren’t so feeble but it is the custom the Finnish family to have the youngest one somewhere near so they can be of assistance to the mother and father. And that was the role he played for his mother and father. My brother Wallace finished school in Andover, and he was married to Betty Lyman of Andover and they have seven children: Sidney, Ned, Jerad, Jill, Betsy, Betty Ann, and Andrew. They now live in Buffalo. Ding at one time was associated with the aircraft industry, with Curtis Wright Aviation Co. in Buffalo. He was a troubleshooter for all their planes. He traveled a great deal when the children were small. He was responsible for the inspection of all new planes when they left the plant. It was during the time of the war [WWII]. This is about all the information about Karen Huskonen’s heritage that I can recall right now. Yesterday I gave myself a belated Christmas present: yet another DNA test. To date, I had tested my DNA with AncestryDNA, FamilyTreeDNA, and MyHeritage DNA. I tried testing with Living DNA, but in three separate swab sampling attempts, that DNA testing service was unable to get meaningful results from my samples so they refunded my fee. So that left 23andme as the one major DNA testing service that I had yet to test with. In reviewing a pre-Christmas sales flyer from Best Buy, I noted an offer for a 23andMe test kit for $69, which was ‎$30 off the standard price. The ad blurb promised a “detailed breakdown of your ancestry.” To sweeten the offer, Best Buy would throw in a $10 gift card with each DNA kit purchased. 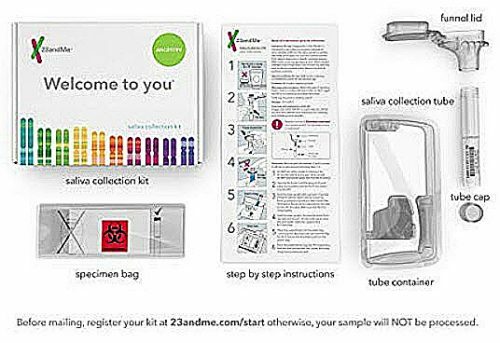 So yesterday I drove to the nearest Best Buy and bought a 23andMe kit. As with the offerings from the other DNA testing services, this is an autosomal DNA test. The kit is for collecting spit and includes a postage-paid kit box/mailer for return to the lab. The collection tube was the fanciest yet, with a funnel atop the collection tube and an attached “funnel lid” that included a small amount of liquid to preserve the spit sample. The instructions said to refrain from drinking or eating for at least 30 minutes, so I waited for 1.5 hours just to be sure. I had no trouble providing enough spit to fill the collection tube to the fill mark. Then I closed the “funnel lid” attached to the spit tube to automatically release the preservative. After shaking the mixture for a few seconds, I twisted off the funnel from the sample tube and replaced it with the tube cap. I then placed the tube into the specimen bag and sealed it. The bag went into the mailer box which I then sealed. Today, I delivered the box to my local post office to make sure that it went into the mail system as safely as possible. After collecting my spit sample, I registered the kit by creating an account on the 23andMe website, making sure that I correctly entered the 14-digit kit number from the specimen tube (the tube also had a barcode with that number for use in the lab). At the end of the registration process, up popped an offer that I couldn’t refuse: Upgrade the test to provide my health report based on my DNA test for only $100 more (a $30 discount). 23andMe has built its reputation on this more extensive DNA testing and reporting, and it has been appealing to people who want to know if they are genetically predisposed to any health conditions. So after a few moments of consideration, I took the plunge into the world of health reporting based on DNA. Once I opted for the upgrade, 23andMe drew me into answering questions about my ethnicity and ancestry — and then more questions about me. One observation: the company has no doubt paid big bucks to its legal team to create all the Terms of Service (TOS) documents and the related agreement forms that must be signed by participants. The series of surveys covered a wide array of topics including my diet, personal interests, and preferences, physical condition, mental condition, past medical diagnoses, etc. Having read through all the TOS documents, I had little fear that my privacy would be jeopardized by these surveys, and I, in fact, found answering the surveys to be interesting exercises. It did take a good bit of time, however. So the sample is in the mail to 23andMe. Now we wait to see the results and reports from this DNA testing service and compare them to my other test results. Mary Jane Dingman was born on December 14, 1908 (110 years ago today), to Wallace Betts Dingman and Grace Green Morley Dingman. She was born at the family’s home in Conneaut, Ashtabula County, Ohio. She grew up to be a teacher, wife, and mother, then a teacher again, business manager, and finally a caregiver. Her husband was Walfrid Herbert Huskonen, who grew up on a farm across the road from her Dingman grandparents’ farm in Williamsfield, Ohio. Mary went to school in Conneaut and Walfrid in Williamsfield, but they saw each other over the growing-up years. They decided to get married as young adults living in the Cleveland area. At the time, Mary was an elementary teacher in Bedford, Ohio, and Walfrid was employed as a patternmaker by Lake City Malleable Foundry Company in Cleveland. Mary and Wally went on to be parents, raising three children in Andover, Ohio. For many years, she was a stay-at-home mom while he became an entrepreneur, owning and operating Andover Pattern Co. in Andover. Remembering her today has prompted me to start to gather together what I have on file for Mom. I plan to assemble it into a multiple-part life story about a strong and loving woman—my mother. Watch this space for installments in the coming days. At a meeting of the Finnish American Heritage Association (FAHA) at its museum in Ashtabula a couple of years ago, a friendly lady remarked to me that she rode to work with my father, Walfrid Herbert Huskonen, during World War II. They drove from my hometown, Andover, Ohio, about 12 miles south on Ohio Rt 7 to Glauber Brass Manufacturing Co. in Kinsman, Ohio. I knew Dad worked as a patternmaker at Glauber Brass before he started up Andover Pattern Co. on our property in about 1948. In fact, I visited Glauber Brass with him as a kid once or twice when he was delivering pattern equipment for casting kitchen and bathroom faucets in the company’s sand molding and casting foundry. It was only recently that I sat down with Dorothy Nicolaus Hedrick to talk about her rides to work with Dad. The sit-down finally occurred late this summer after the annual FAHA Fish Fry at Saybrook Township Park just west of Ashtabula. Dorothy did not attend, she being 95 years old. Instead, her cousin, Linda Sippola Riddell arranged for us to get together at Dorothy’s nearby home after the Fish Fry. I owe a big “thank you” to Linda for reminding me from time to time about possibly interviewing Dorothy and especially for acting as a go-between to finally make it happen. Dorothy and Linda both were part of the Finnish-American community in southeastern Ashtabula County in the 1940s and now live in Ashtabula. Dorothy Nicolaus Hedrick holds a cast brass ashtray from Glauber Brass. The closeup below shows the bottom of the ashtray clearly showing the “man in the moon” design. Ashtray courtesy of Linda Sippola Riddell. When we had this chance to talk, I learned that Dorothy lived in Andover with her sister Rita. Their husbands were away serving in the military. She rode to work with Dad and two other men from the Andover area. The men took turns driving and shared the cost of gas. Dorothy contributed a small amount for riding along. The other men were Merle Thompson and Walter Fleming. Dorothy reported that the ride was arranged by her uncle Elmer Pouttu who worked at Glauber Brass. Her mother also worked at Glauber, so it was something of a family affair. Dorothy worked in the core room. In discussing this with her, I determined that she was involved in forming sand cores in coreboxes. These cores would then be “baked” so that they were firm enough to be placed in sand molds to form the internal cavities inside the brass faucet castings. She did not like working in this department and was transferred to the casting cleaning department. Here, her work involved dipping castings into acid vats. The purpose: to clean off any sand and binder clinging to the new castings. She and her co-workers had to wear heavy aprons and long rubber gloves for protection from the acid. Dorothy reported that she worked at Glauber Brass for about two years. On V-J Day in 1945, when World War II was ended with the victory over Japan, Dorothy and many other employees were informed that they would be laid off, as Glauber Brass would no longer be producing brass castings for the war effort. So this chance encounter with Dorothy at a FAHA event provided an opportunity for me to learn a little bit more about my father’s early work experience. The weekend just ended was turning out to be a dismal one for me sport-wise. On Saturday, the Ohio State University Buckeyes lost a college football game to Purdue University that they should have won. On Sunday afternoon, the Cleveland Browns lost their game against the Tampa Bay Buccaneers in overtime. And on Sunday evening, the Cleveland Cavaliers basketball team (without LeBron James’ who moved this year to Los Angeles Lakers basketball team) lost its home opener against the Atlanta Falcons. 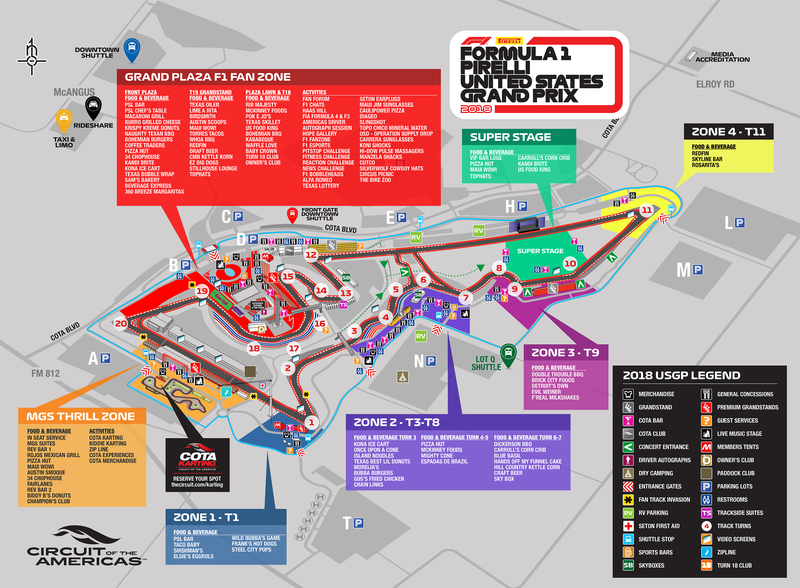 Then I watched a video of the U.S. Grand Prix at the Circuit of the Americas near Austin, Texas. recorded earlier in the day on Sunday. More than 50 years ago, I was an avid fan of auto racing and even did some freelance reporting for the Cleveland Plain Dealer and Auto Week on professional and amateur road racing events, including the U.S. Grand Prix when it was held at Watkins Glen, New York, for several years. I had not closely followed FI racing in recent years, and in fact, I was not familiar with the Circuit of the Americas. Imagine my pleasure when I Googled for results late on Sunday and learned that the Finnish driver Kimi Räikkönen won the U.S. Grand Prix, driving for Scuderia Ferrari. I watched the recorded video of the entire race. Räikkönen started from the pole and led most of the laps. It was his first win in Formula One since 2013. At age 39, he was the oldest driver in the race. The award ceremony at the end of the video included him standing on the winner’s podium for the playing of Maamme, the Finnish national anthem. 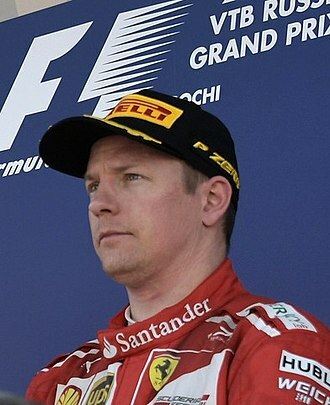 Räikkönen won the FI World Championship in 2007 during an earlier driving stint with Ferrari. During his long career, he also drove for the following FI teams: Sauber, MacLaren, and Lotus. Next year, he will be again driving for the Swiss-based Sauber team, this time under the banner of Alfa Romeo Sauber, in a car powered by a Ferrari engine.